Somehow we've found our way into Bruges, Belgium. 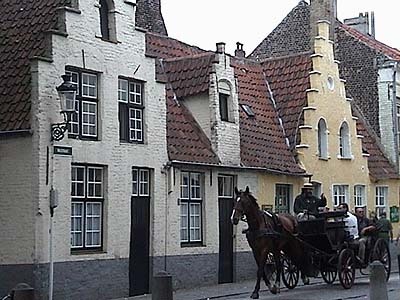 This is the largest and best kept medieval town in Europe (at least Bruges people say so). We agree. 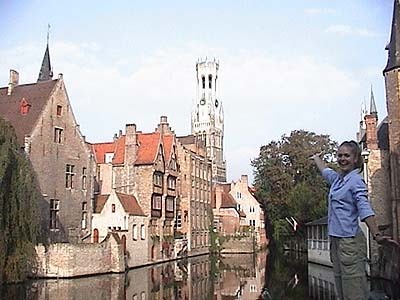 Bruges is called the "Venice of the North" because of its beautiful canals. It has a distinctive medieval flavor, with narrow cobblestone streets and step gable housefronts. This place is what Disney's international village aspires to be, except that it's real, a living museum. However, the best thing about Belgium has been the food. I can't pull Jill away from the waffles and chocolate. I've eaten four buckets of mussels in the last 24 hours. Even Jill, who isn't a shellfish fan, enjoys eating this Belgian speciality, mussels in white wine sauce. No wonder Brussels rhymes with mussels.